Last week Tanner had a week off at the end of his quarter. It's crazy to think that one quarter is already done...where did the time go!? He is 1/12 a dentist, and that's kinda crazy. We chose this school because it was 3 years instead of 4, and sometimes we wish it was a lot longer, because time just moves so quickly! You know you're bad at blogging when you have to keep saying "I can't believe it's insert month" every post, but it's true! This is crazy that it's already October!! We had booked flights to Utah for a couple days, and I'm so glad we did! However, Tanner's Friday final got cancelled, and so did my work, so we could have left Thursday night! But, instead we headed to the beach for some relaxation, and were able to deep clean the house after a crazy week. We arrived in SLC around midnight, and stopped at Krispy Kreme's for donuts with our friends, and then had a slumber party until about 2:30! It was crazy and we loved it. We then went to good ole' Kneaders with our friends and family, and it was delicious of course! My next stop was Sodalicious with the girls and some shopping, while the boys played tennis, sold our scooter, and took a longgggg nap. Then that evening we hit up Cafe Rio which made our hearts so happy. We ended the night with some s'mores, good music, and lots of laughs. The next morning, Sunday, we attended church, and then went for a beautiful drive up the canyon before we headed to be with the Zylstra's. 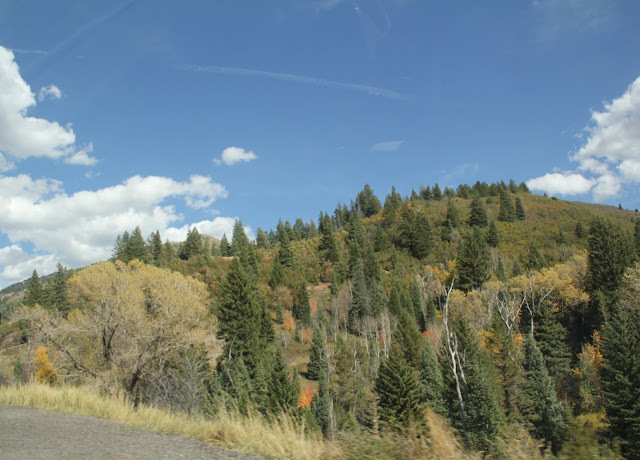 Unfortunately Utah was pretty hot while we were there, but the leaves had still changed and it was beautiful as ever! We then went to Tanner's brother's new home they just built, and it was such a blast to spend a couple days with their family. We even had the best view of the blood moon! On Monday we had a little spa day for an early anniversary celebration (I can't believe it's been another year almost! ), went to the BYU bookstore, met up with some friends at Slab pizza, explored how much Provo has changed in 6 months, and drove by our old house! We then went to dinner with the Zylstra's and stayed up late eating ice cream and watching Netflix. On Tuesday, we had a couple errands to run before we left, so back in Provo we met up with Shelley for lunch at Cafe Rio again, and then drove up to SLC for dinner with the fan before we left. It was a quick trip full of family time, and lots of food, but we are so happy we went! When we got back to San Francisco, I had to work the rest of the week, but we still got to sleep in together and have fun in the evenings (which we had missed!). Wednesday night was a memorable evening of biking down the Embarcadero to the Giants vs. Dodgers game. We scored with a FREE bike valet (who knew there was such a thing!? ), and great priced tickets! We devoured diet coke and garlic fries, and had such a good night with Chad and Melissa. I had a "few" tears shed Sunday night and Monday morning realizing that our week of fun was suddenly over. This quarter is going to be even more rough, so already looking forward to the 2 days off at Thanksgiving! Cheers to fun, and husbands! Whenever I come back to Utah after the summer, I totally indulge on all of the awesome food too! This is making me fear dental school so much!!! AH! Looks like such a fun week!! !